Good Health and Clean Vitamins are the center of what we do. We do this by crafting a boring pill into a delicious yet nutrient rich gummy, made with no artificial colors, flavors, or ingredients. We love all faiths! Following a Halal and Kosher lifestyle is important to you, so its important to us. We are the only vitamin company that passed a rigorous inspection to obtain a Halal and Kosher certificate. We want you to feel safe knowing you’re providing your family quality vitamins without compromising your values. We believe in making nutrition easy and fun and only using ingredients your body can use. That means everything is made from non-GMO, allergen free, premium eco friendly ingredients. My household is halal and vegetarian, making these vitamins a perfect, fun way to meet our nutritional needs. My husband gave up his boring multi-vitamin pill, after tasting these gummy vitamins, and now he is a convert too. My stomach is sensitive to the binders in some vitamins, but these do not bother my stomach at all. The vendor is helpful and courteous. This is my second order and we will definitely be ordering again. Finally a vitamin that doesn't make me nauseated! I have tried so many on the market but always felt a little sick afterwards. 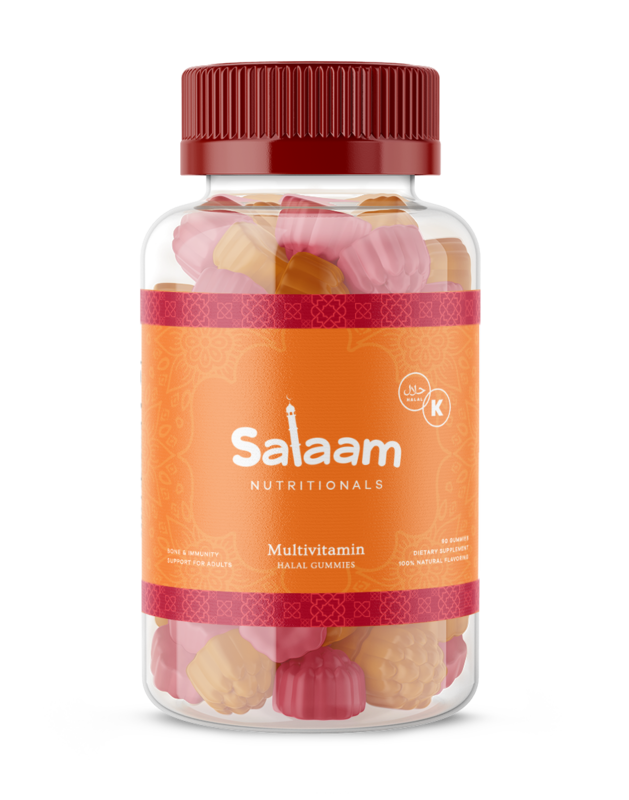 When I first heard about Salaam Nutrionals, they offered vitamins to just kids. Now they have a full-line of vitamins for the entire family. When they launched their gummies for adults, I pounced on the opportunity to stock up. This stuff tastes like candy!! Also, the fact that it is Kosher, gluten-free, and Halal, I know that it is safe. I'm a Salaam Nutrional--lifer! Sign up with your email address to receive our exclusive promotions, new product launch announcements and updates.